The Lodge once again supported the Charley Sullivan Challenge 50-miler the weekend after Thanksgiving. 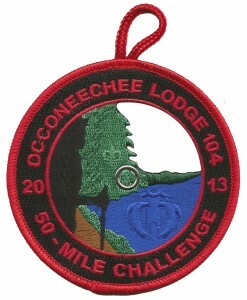 That’s 50-miles in 24 hours folks! Neusiok Chapter hosted the event. 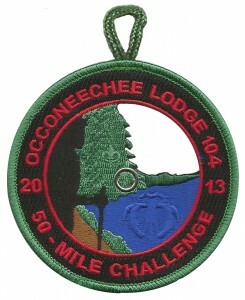 This event was held at Falls Lake near Raleigh. 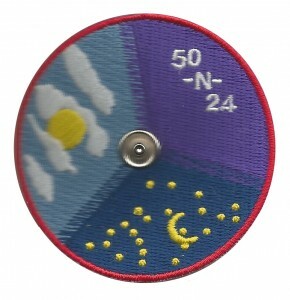 There were 4 different patches issued at the event…well actually 5 because of the design. The main patch has a window that allows different scenes to be “dialed” in by way of the patch (eX2013-5) that attaches to the back of the patch by a snap. The green border eR2013-6 was issued to staff. 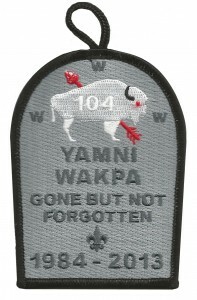 The black ghost patch eR2013-7 was issued to the executive committee and donors. 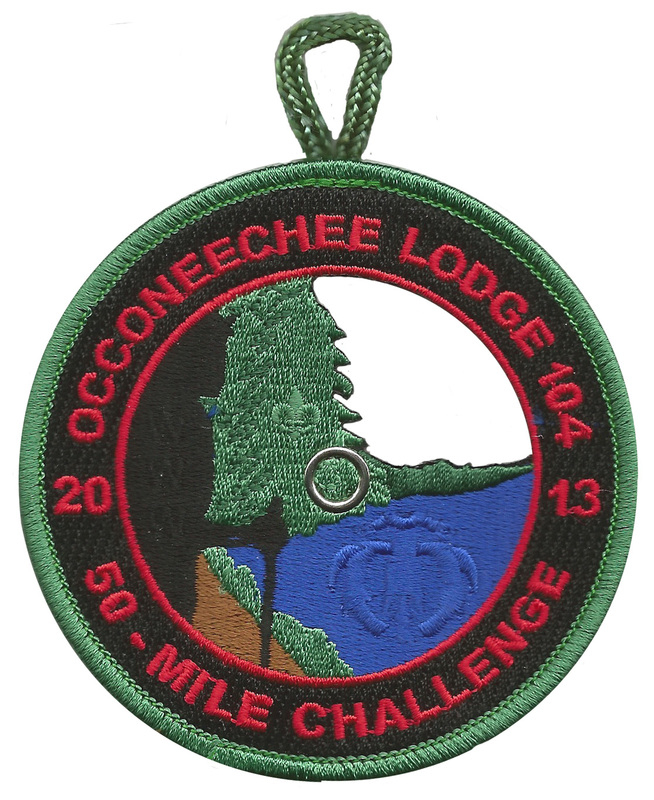 The red border eR2013-8 was the participant patch for those completing the 50 miles in 24 hours. 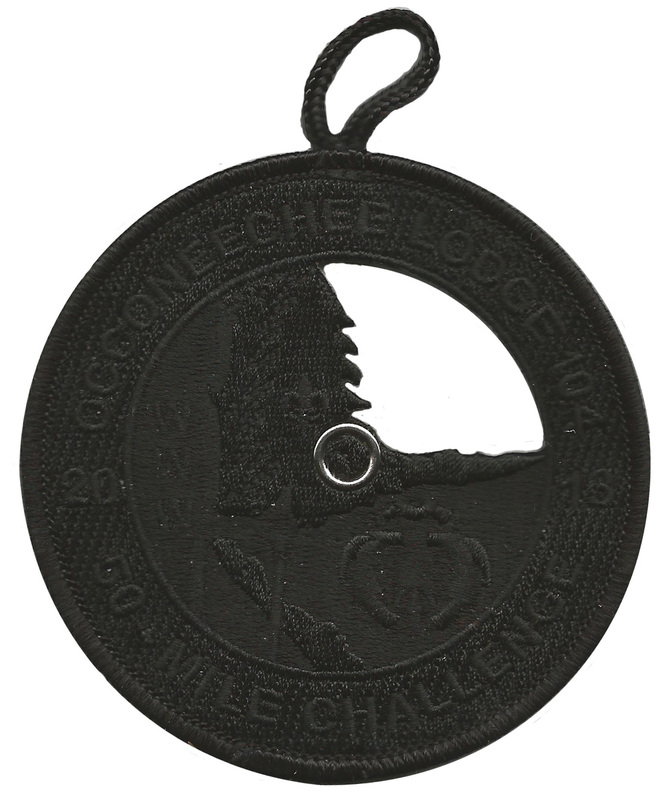 The blue border eR2013-9 was issued to cub scout participants that hiked a portion of the trail. 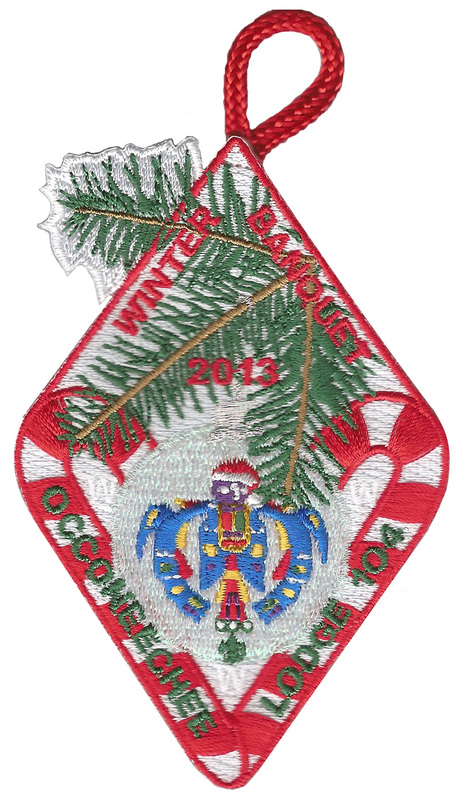 Winter banquet was December 7th and eX2013-10 will be the last event patch issued for the year! The next monochromatic odd shape (CSP) will be sold at banquet. This will be the second in the series and the purple one. As for Winter Banquet, this might be the last one as we know it as the LEC voted at LLD in November to host a banquet in October during the new Fall event. We will not have an ordeal at the 2014 fall event as we have in the past. All ordeals will take place in March, May and September. This event is to replace the old “fun” weekend of Pow-Wow. The new fall event, yet to be named will consist of a weekend of service, some fun activities, banquet on Saturday night and then Vigil night on Saturday evening. 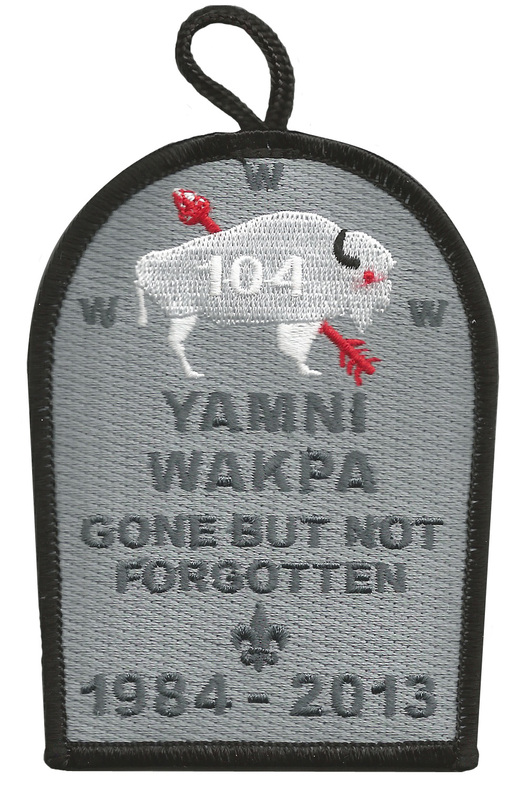 One last thing….Yamni Wakpa Chapter issued their death patch at a cookout in early November. They met with their new brothers from the former Natisihi Chapter at Camp Durant. During the cookout, a Chapter meeting was held and the combined Chapter’s youth chose a new Chapter name of “Netopalis” which is Lenne Lanapi for “Warrior.” The name was approved by the Lodge EC at the LLD executive committee meeting. Aren’t the Sullivan hike pieces eR rather than eX? I’m enjoying carolinaoa.com even though I don’t collect NC. I concur that the Sullivan Hike pieces should be eR’s. Also, the post repeats the description of the red RE patch under the blue RE patch picture. You might want to correct that. Love the site!